Macau-based gaming operator SJM Holdings Ltd on Tuesday reported a 65.1 percent year-on-year increase in net profit for the third quarter of 2018, to HKD707 million (US$90.1 million). SJM Holdings reported gross gaming revenue of approximately HKD10.95 billion for the three months to September 30, up by 8.8 percent from the prior-year period. The tally included approximately HKD5.17-billion gaming revenue generated from 16 satellite casinos – venues using SJM Holdings’ gaming licence but managed by third parties. “We continue to expect the satellite segment to underperform the market as customers vote with their feet and increasingly patronise Cotai properties,” wrote Grant Govertsen, an analyst at Union Gaming Securities Asia Ltd, in a note reviewing SJM Holdings’ third quarter results. Group adjusted earnings before interest, taxation, depreciation and amortisation (EBITDA) increased by 26.7 percent year-on-year to HKD919 million in the third quarter, the firm said in a press release. Adjusted EBITDA margin for the period increased to 10.8 percent from 9.4 percent a year earlier. In the third quarter, SJM Holdings recorded VIP gross gaming revenue of nearly HKD5.04 billion, up by 6.6 percent from the prior-year period. VIP chip sales totalled HKD166 billion in the period, and the VIP gaming hold percentage – before commissions and discounts – was 3.04 percent, down from 3.20 percent in the third quarter 2017, said the firm. Gross revenue from the mass-market gaming segment stood at approximately HKD5.62 million, an increase of 10.6 percent year-on-year. SJM Holdings operated an average of 291 VIP gaming tables and 1,408 mass-market gaming tables during the third quarter this year. The company operated a total of 2,637 slot machines in the period, it said. “We see nothing so far to get us upbeat on the stock, as such we remain on the sidelines,” said Sanford C. Bernstein Ltd, commenting on the third quarter results of SJM Holdings. Gaming revenue at flagship property Casino Grand Lisboa (pictured) was up 11.8 percent year-on-year to HKD4.17 billion in the third quarter, whilst the property’s adjusted EBITDA increased by 18.6 percent to HKD496 million. For the nine months ended September 30, Casino Grand Lisboa’s gaming revenue was HKD12.12 billion, up 9.3 percent from the prior-year period. Adjusted EBITDA for the nine-month period was HKD1.59 billion, a year-on-year rise of 25.6 percent. For the first nine months of 2018, SJM Holdings’ gross gaming revenue stood at nearly HKD33.0 billion, a 8.0-percent expansion judged in year-on-year terms. Adjusted EBITDA for the period was up 28.9 percent year-on-year to HKD2.88 billion. The firm’s net profit for the nine months to September 30 was HKD2.21 billion, an increase of 59.4 percent from the first nine months of 2017. SJM Holdings management said capital expenditure during the third quarter 2018 amounted to HKD1.86 billion, “which was primarily for construction in progress and furniture, fixtures and equipment”, understood to be mostly related to the development of the firm’s first property in Cotai. 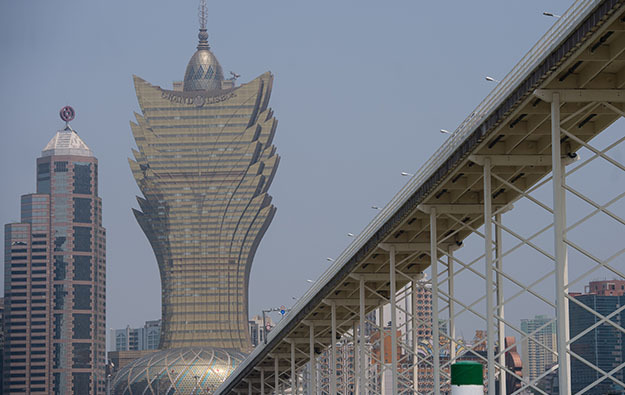 The latter, named Grand Lisboa Palace, is scheduled to open in 2019, the firm said in its filing. The whole resort is to cost approximately HKD36 billion and is due to open in the second half of 2019, shortly before the expiry of SJM Holdings’ current Macau gaming rights in 2020.